Shocking is the discovery that a store is the most visited destination for Swedes going on an outing. But with its 21.000 square meters and more than 4 million visitors a year, Gekås Ullared is not only the largest department store in Scandinavia, it also tops as the number one destination for Swedes on a day trip. In order to make it easier for long distance visitors, the Gekås group now includes Gekås Holiday Village and Gekås Camping for those wanting to stay the night. And people do travel long distances to get there. Although there are busses, even from Gothenburg wich is over 100 kilometers away, Gekås' own surveys presents the average customer as someone having travelled more than 230 kilometers by car to reach Gekås Ullared. Add to that another 230 kilometers for the return trip, and suddenly we have an average customer who drives 460 kilometers just to do some shopping – shocking, is it not? Gekås Ullared was founded in 1963 by Göran Karlsson, who used his initials to arrive at the name Gekås (In Swedish, the letter G is pronounced 'Ge', and K 'Kå'). 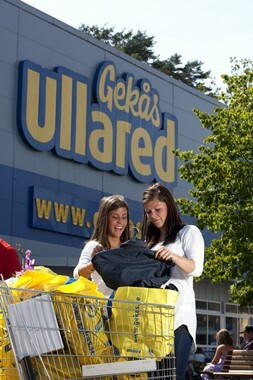 The second part of the name, Ullared, comes from the small town Ullared in which Gekås Ullared resides. 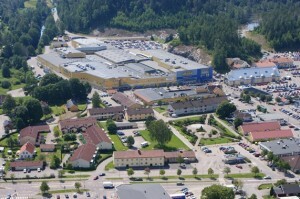 As a proper department store, Gekås Ullared sells everything from clothes to electronics to food, toys and fishing gear. You can find pretty much anything there, and at great prices. While some of it is from little known brands, it is not uncommon to find clothes and other items from well known brands as well. There are a lot of interesting statistics out there, like how its sales record keeps changing, with the latest one at 3 400 million SEK in 2009. But for me, one of the things I remember most vividly about Gekås Ullared, was how I could not get in on my first visit there. Mum had just bought a summer house just ten kilometers from Ullared, and we decided to have a look at this 'Gekås Ullared' everybody was talking about. Well, when we got there, we saw this huge parking lot with absolutely no free parking spaces anywhere. We circled for a while, and noticing a line of people on a road outside the parking lot, we decided that there must be a circus in town, or perhaps a festival. When we eventually found a parking space, I shall never forget the faces we made as we realized that the true reason for the line was that Gekås Ullared was currently full and would not allow more people in until some had left! Indeed, looking at their website, the longest recorded queue was 2,7 kilometers long, and the longest recorded queueing time 3,5 hours! So, there you have it. When someone asks you about the most visited destination for outings in Sweden, Gekås Ullared is the answer. And when someone asks you what on earth people do there, shopping is the answer. And when asked if you do not find the Swedes pretty weird… well, I guess there is some truth in that, wouldn't you say?